So they've come out with Chia pets of U.S. Presidents' heads. Not so strange. But, there is an Obama one that grows a very afro-looking plant on his head. Is this weird to anyone else? 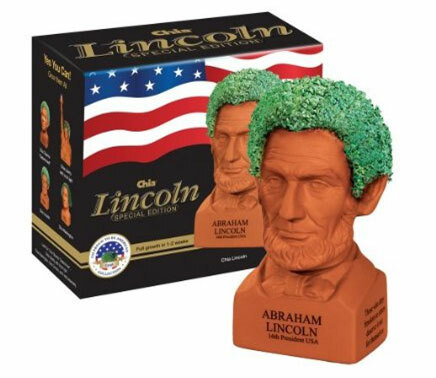 Did you note that buying this Chia pet will symbolize "liberty, opportunity, prosperity and hope" in your home? I sure did. I don't get it. Do these symbolize any of that stuff for you? I can't really put my finger on it, but there's something about an afro-growing Obama head that seems a little behind the times to me. Not like actual, real-life racism, but as a modern woman I'm uncomfortable. For some reason those two are just funny. The Obama one just seems little too soul-tastic for me. Inappropriate? Any thoughts? Totally in agreement on the Obama chia pet. Although, it might make a great Christmas gift... Lol! Holy Hair - this is amazing! Just think of what great gag gifts these would be!! Obama's looks like an afro.. slightly racist? Bahahahaha! My old boss is a HUGE Obama lover so I bought this for him for Christmas last year! We both saw it as a joke and a pretty good conversation piece at his Law Office! Haha! My thoughts: they make the Abe Lincoln and George Washington Chia heads so they can't seem totally racist. This way, it seems they gave the two old white presidents a fair run. There is no racism here - the white presidents have the exact same hair. I think it is an overreaction. Battlestar Galactica - don't you dare judge me. Breakups - I may be too happy. Royal wedding - I'm addicted. Christmas has arrived in my home and office!